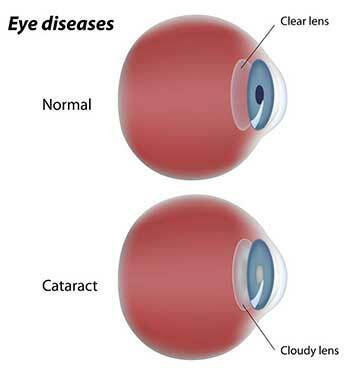 A cataract is a clouding of the normally clear lens of the eye. For people who have cataracts, seeing through cloudy lenses is a bit like looking through a frosty or fogged-up window. In fact, cataract means waterfall and that is how the condition got its name; people felt like they were looking through a waterfall. Clouded vision caused by cataracts can make it more difficult to read, drive a car (especially at night), or see the expression on a friend’s face. Most cataracts develop slowly and will not disturb your eyesight early on. With time, cataracts will eventually interfere with your vision; however, it is easy to correct with a simple procedure. At first, stronger lighting and eyeglasses can help you deal with the changes cataracts cause. If impaired vision interferes with your usual activities, you might need cataract surgery. Fortunately, cataract surgery is generally a safe, effective procedure.